A local businessman from Cookstown has called upon one hundred businesses to show their support for him as he takes things to a whole new level by attempting one of the greatest physical tests known to man – The Ironman Challenge. Conor Devine, Principal at GDP Partnership, was diagnosed with Multiple Sclerosis (MS) in 2007 and struggled badly for a few years with the condition but since 2010 he has worked hard to try and manage his illness and is now regularly taking part in marathons, triathlons and other adventures to help control his monstrous illness in addition to raising awareness about Multiple Sclerosis across the world. MS is a particularly nasty neurological condition that plays havoc with your central nervous system typically attacking people between the ages of 20 and 40 years old. 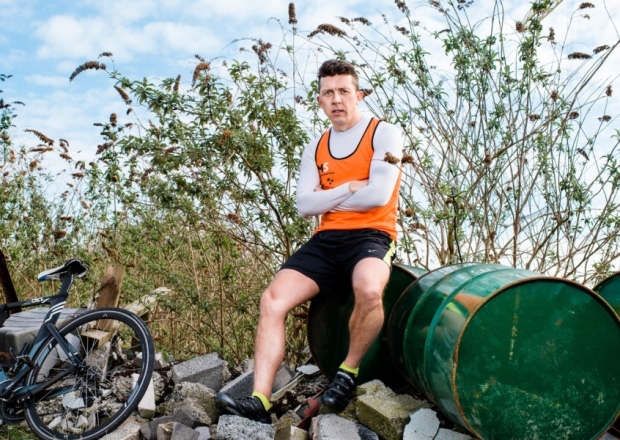 Deciding to raise the bar, Conor came up with six challenges in twenty weeks to include two marathons, triathlons, half Ironman and the main event Ironman Majorca, to raise awareness and raise some much needed funding for the MS Society. Conor is hopeful his fellow business community will get behind him and show their support by donating £50.00 per company. “Between 2006 and 2010 I was very ill, both mentally and physically, said Conor. “However in that timeframe I became a student of the condition and decided that I needed to take some action very quickly as I could feel my symptoms getting a lot more severe and out of control. “Five years later and still working very hard everyday to maintain my health with my plan of medication, real food and exercise, I’m about to take on the ultimate challenge. “Over the last twenty weeks I have been training hard so my body will be ready for the event in Majorca in September. I am passionate about sharing a positive story across the world about MS and I know I can do this with this high profile campaign. I’m also a very passionate businessperson, and I’m now taking this opportunity to reach out to the business community . “The plan is to get 100 local businesses to support me to the tune of £50.00 and over the past few weeks already quite a number have come on board which is great. Through his thought-provoking discussions; his book, ‘Attitude is Everything’, penned in 2013 and informative dialogues on ConorDevine.com, Conor has built up an exceptionally strong blog community and continues to inspire readers each and every day.